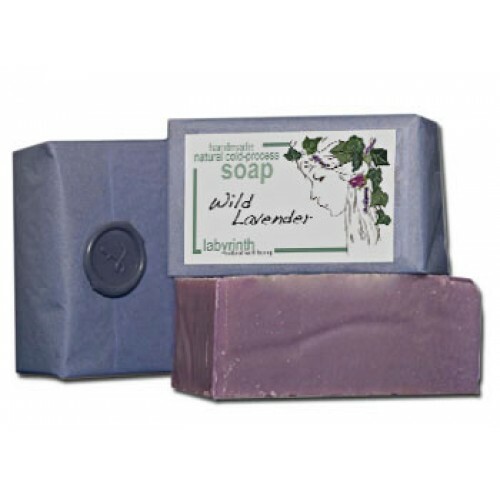 The very word 'lavender' is derived from the Latin 'lavo' meaning 'to wash'. 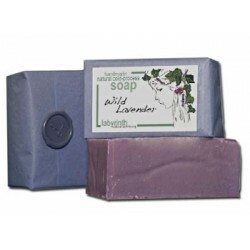 Little wonder then that Lavender is such a popular fragrance for the bathroom. It's calming properties have long been associated with the relief of tension, depression, panic and insomnia, and it is also noted for its soothing effect on sunburn and insect bites, as well as its assistance in relief from the symptoms of rheumatism and arthritis. Good for all skin types - particularly good for oily skin. Olive Oil (Sodium olivate), Coconut Oil (Sodium cocoate), Regulated Palm Oil (Elaeis guineensis), Spring Water (Aqua), Lavender (Lavandula augustifolia), Violet Pigment (Ultramarine). Naturally Occuring: Linalool, Geraniol, Limonene. Labyrinth handmade soaps contain only pure, natural products. No artificial chemicals, preservatives, animal fats or animal derivatives whatsoever. They use finest quality butters and oils to produce a soap that not only cleans but leaves your skin feeling refreshed, moisturised and invigorated. Their palm oil is sustainably sourced.